For 2017's R8, subtle yet meaningful tweaks to the exterior styling ensure the Audi supercar keeps its looks squarely in the 21st century, while also remaining instantly recognizable on the road. Ah, the Audi R8; the stuff of dreams. Since its birth just a decade ago, this supercar has made some serious waves in the auto industry. While relatively new to the luxury supercar game, the R8 made a serious name for itself from the get-go, and this latest iteration is no different. Now, while some may lament the passing these features, we’re here to tell you it’s all good because that means the 2017 Audi R8 only comes with a V10 setup, and really, what’s not to love about that?! There are two variations of the V10 available for the 2017 Audi R8. The “normal” V10 5.2L produces 540 horsepower, while the beefed up V10 Plus pushes out 610 ponies. As the manual has gone the way of the dodo bird, power is controlled via a 7-speed dual-clutch automatic with manual shift mode. And in true Audi fashion, power is sent to all four wheels thanks to Quattro. The 2017 Audi R8 also features Audi’s signature drive select program, accessible via the steering wheel, that allows the driver to toggle between comfort, auto and dynamic driving modes. The Audi’s mid-engine, 2-door coupe set-up has been the same since it was first born into the auto industry, and that’s fine with us. Even its design has seen very little in the way of evolution or change. For 2017's R8, subtle yet meaningful tweaks to the exterior styling ensure the Audi supercar keeps its looks squarely in the 21st century, while also remaining instantly recognizable on the road. There’s no denying the design is much edgier than the previous generation with, aggressive lines and angles replacing sloping silhouettes and soft corners. Audi’s signature side “blades” remain, however, now sliced in two with the shoulderline of the car, which makes the overall look that much more aggressive. LED headlights are standard. Slip into the cabin of the 2017 Audi R8 and you’re met with Audi’s tremendously intuitive and stunning Virtual Cockpit. The system displays everything you’d ever want to know and more, including instrumentation and entertainment/navigation information behind the steering wheel where the gauge cluster would normally be. 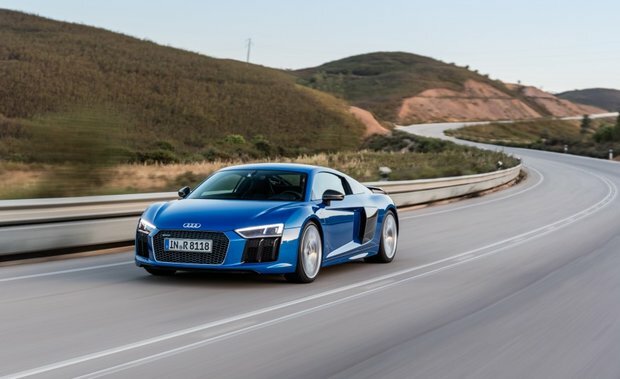 Truly, the 2017 Audi R8 is everything you dreamt it would be, and more. From supercar performance numbers to luxurious interior amenities and an exhaust note that’ll make you weak in the knees, this 2-door coupe has it all. To find out more about the stunning 2017 Audi R8 V10, head down to your local Glenmore Audi today to speak to one of our experts. And you’re going to want to book a test drive with this one, trust us.